These words have taken on a more poignant impact in the months since the election. The heavy weight of closed-eye complacency bore down so completely, raising first and foremost the question: how did we get here? The feckless new world we had suddenly traveled to felt frighteningly familiar; we knew what this story looked like, and so we could anticipate, with dread, everything that came next. For many of us, January 27, 2017 was the day when the spectacle moved from surreal to real, when the idea of Trump's presidency was no longer an intellectual exercise in alternate realities. This was the day that new policies actually began affecting people’s lives in very concrete ways. Executive Order 13769, more commonly referred to as “the Muslim Ban,” was issued. Spontaneous protests formed at airports across the country, pro bono lawyers showed up to consult with passengers who were being denied entry. This banding together was inspiring, a beacon of hope in an overwhelmingly desolate atmosphere. The order was struck down by judges across the country. It felt like a victory, but cutting off the head of the hydra soon yielded another in its place. Executive Order 13780 was issued on March 6, 2017. It was a simple repackaging of the original order. Some of the language shifted; the explicit references to 9/11 were taken out. Pulled from State Department reports, justifications were inserted, outlining why each of the six countries was included: “Iran does not cooperate with the United States in counterterrorism efforts . . . Libya is an active combat zone . . . Somalia has porous borders . . . Historically, Sudan provided safe havens for Al-Qaeda . . . the Syrian government is engaged in an ongoing military conflict . . . Yemen is the site of an ongoing conflict . . . Iraq presents a special case.” Iraq was removed from the list of banned countries the second time around. The U.S. still has a lot of business interests in Baghdad, apparently, so the potential fallout in that department was something Trump could understand. Executive Orders 13769 and 13780 were not about protecting the country from terrorism. These Executive Orders were about control, a flashy way to secure populist support of campaign promises. That Trump chose to exert this control by prohibiting entrance to the U.S. from six Muslim-majority countries is telling: they were identified by his administration as the easiest targets. It's this mass targeting of the vulnerable (refugees) and misunderstood (Muslims) that recently brought The House Is Black to the forefront of my mind. 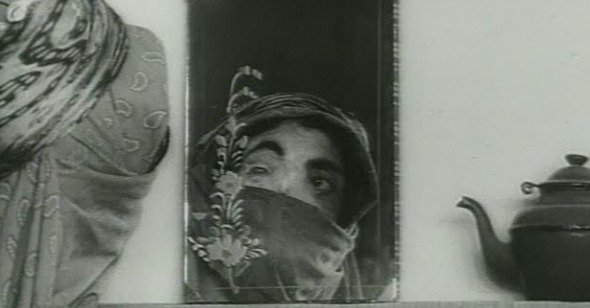 Farrokhzad wrote, directed, and edited this poetic, 21-minute document of a leper colony in Northern Iran, and it’s the only film she ever made. Her cuts are often jarring, the unexpected relationship between sound and image create a feeling of almost 360-degree immersion in the space. The rhythm of the edits and her juxtaposition of poetic visuals with an unwavering gaze on the inhabitants of the leper colony create a gentle directness that forces the viewer to absolutely focus on her subjects. It’s a film that reminds you that societies are good at creating outcasts. Since ancient times, lepers around the world have been refused entry into civic life, forced to wear bells, live in isolation, and in some cases be criminalized for their condition. In a way, it feels like we have not come very far. We are still isolating and marginalizing; Executive Orders 13769 and 13780 come awfully close to criminalizing. America’s deeply problematic relationship with Islam is well documented and discussed, but it persists. Immediately following the election, amidst shock and grief, there was a momentary trend among the liberal elite to look at white working class America with a compassionate eye—how did the divide between “us” and “them” grow so wide? Aren't we part of the same country? But this kind of reflection—and the necessary follow-up of inclusion—was short-lived. In the months since January the dividing lines have only deepened. Horror after horror coming out of the Trump administration has only served to further vindicate “our” point of view, the sentiment becoming “We were right, they were wrong. Ignorant people elected an ignorant president and now look at the mess we are in.” Leprosy is perhaps the most extreme example of the us-vs.-them condition that colors every society. The House Is Black casts a light on the dangers of institutionalized neglect and marginalization. It calls upon us to look directly upon an ugliness that we would normally avoid (and for centuries have actively shut away), to see the beauty in it. Farrokhzad calls to consciousness how the act of interfacing with and caring for something perceived as incurable could in fact put an end to it all together. a separate thing rotting huddled in a corner.